Sometimes being in the right place at the right time can make a huge impact. Randy was listening on the maritime net March 21st, and heard a mayday call. A boat in distress off the coast of Mexico, approximately 120 miles west of Ensenada was putting out a mayday call. 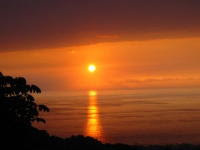 Due to vessel problems his signal was very weak, and Randy - KH6RC - from his ham radio station here at Leilani Bed and Breakfast on the Big Island Hawaii, was the only person who was able to pick up the weak mayday call from the sailboat. Rex - KC5AGO , in Stonewall, Texas, was able to hear Randy's contact, and notified the US Coast Guard, with Randy acting as the relay for messages to and from the boat in distress. Here is a video of the man and dog rescue for those who want to see your Coast Guard in action. The Coast Guard said that if Randy had not heard that call, the results could have been very tragic. to me. Anyways, I'm definitely happy I found it and I'll be bookmarking and checking back frequently! love the theme/design), I don't have time to read through it all at the minute but I have book-marked it and also added your RSS feeds, so when I have time I will be back to read more, Please do keep up the awesome work. in I.E., it's got some overlapping issues. I simply wanted to provide you with a quick heads up! Apart from that, wonderful site! I'd really love to be a part of community where I can get feedback from other experienced people that share the same interest. If you have any suggestions, please let me know. Kudos! I hardly comment, but after looking at some of the responses on this page "Mayday call off Mexico picked up in Hawaii". some of these remarks appear like they are written by brain dead visitors? I wouldn't mind writing a post or elaborating on some of the subjects you write regarding here. Again, awesome site! In fact no matter if someone doesn't be aware of after that its up to other users that they will help, so here it takes place. I seldom write remarks, however I browsed some of the remarks here "Mayday call off Mexico picked up in Hawaii". Is it simply me or does it appear like a few of these remarks come across like they are written by brain dead people? :-P And, if you are posting on other sites, I'd like to keep up with you. Could you make a list of the complete urls of your public pages like your linkedin profile, Facebook page or twitter feed? It's amazing to pay a quick visit this web site and reading the views of all friends about this paragraph, while I am also zealous of getting familiarity. totally, however this article presents pleasant understanding even. Hi, Neat post. There's an issue along with your web site in web explorer, may test this? IE nonetheless is the marketplace leader and a good component of other people will pass over your great writing due to this problem. Hello, I read your blog daily. Your humoristic style is witty, keep doing what you're doing! greatest I've discovered so far. But, what in regards to the conclusion? Are you sure concerning the source? of info in such an ideal means of writing? I've a presentation next week, and I am at the look for such information.